• 96 Tracks! YES, NINETY SIX TRACKS! Create as many tracks up to 96 as your iOS device will let you. • BeatPad midi plugin: Tap the folder icon/new/track/midi then tap the Midi Track's input button to select BeatPad. RoadWriter is the premier songwriting app for songwriters, recording artists and music industry professionals who need to remain creative on the fly. RecForge II is a powerful Dictaphone and audio editor for Android. LoopMash is an innovative virtual instrument that presents you with a new way to blend simultaneously up to four two-bar loops together by juggling similar elements across looped beats and tunes. Now ported to the iOS platform, this sizzling hot instrument lets you choose from over 40 presets and 250 included loops ranging all the way from ethno to electro. Quality content, intuitive control and 3-D navigation for effortless page browsing make this app a must-have for party-goers, music aficionados and pretty much everyone in between. LoopMash for iPhone and iPod touch brings the future of music technology to your fingertips. LoopMash HD is an innovative virtual instrument for blending up to eight four-bar loops together by juggling similar elements across looped beats and tunes. Now ported to the iPad platform, this sizzling- hot instrument lets you choose from over 30 presets and 258 included loops ranging all the way from ethno to electro. Quality content, 19 cool live performance effects such as tape stop and stutters, intuitive control and 3-D navigation for effortless page browsing make this app a must-have for party-goers, music aficionados and pretty much everyone in between. 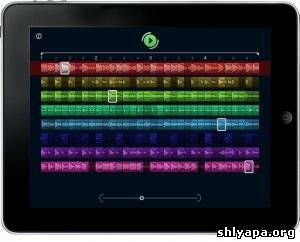 LoopMash HD for iPad brings the future of music technology to your fingertips. FL Studio Mobile HD allows you to create and save complete multi-track music projects on your iPad, iPhone and iPod Touch. You can even load the FL Studio Mobile projects into the 'FL Studio Desktop PC' version* and take them to the next level. DM1 is an advanced vintage Drum Machine. It turns your iPhone into a fun and creative beat making machine. Easy and fast to use, loaded with 99 superb electronic drum kits and beautiful hyper-realistic graphics, DM1 has been designed for a lot of instant fun. JamUp is the world’s best Guitar/Bass Multi-Effects Processor for iPad and iPhone. Cubasis is SteinbergТs streamlined, multitouch sequencer for the iPad. Specially designed for quick and easy operation, Cubasis makes recording, editing and mixing a breeze. Record tracks in DVD audio quality, and edit your music with the Key and Sample Editors, while the included mixer and audio effects polish your song to perfection. Cubasis comes loaded with dozens of virtual instrument sounds which can be played in real time using the virtual keyboard and drum pads. CubasisТ projects can be even opened in Cubase under Windows and OS X! Cubasis places touch-intuitive production tools in your hands, opening up a new world of possibilities for your creativity.